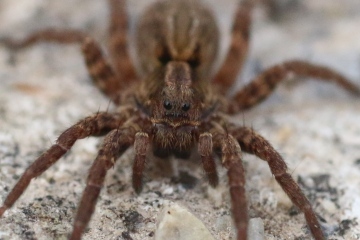 No, these are male Amaurobius similis. 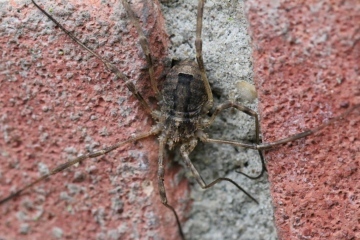 This is a common spider of walls, fences, windowsills etc in houses and gardens. Can you please provide a full postcode so that your record can be added to the recording scheme contact us. I hope that this is as suggested, on the outside of my house this morning. This was on my house wall at Horsey Corner Norfolk TG4523 on 18.11.2013. I've tentatively identified it as Odiellus spinosus but would be grateful for confirmation. The location name is Horsey Corner in East Norfolk. It was on the outside of my house adjacent to the front door. 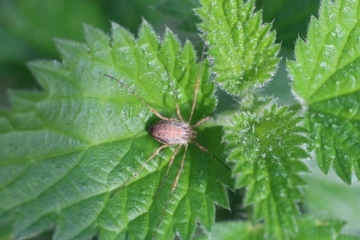 No, this will be Opilio canestrinii, the harvestman I first found in the Lea Valley in Essex in 1999 and which is now turning up all over the country (see Opilio canestrinii). Good to have another record of this. What location name and situation was this? I'm hoping that the image is of Opilio parietinus. Grateful for confirmation. 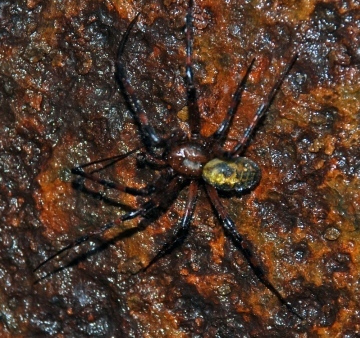 Your spider is probably Meta menardi, but it is not possible to be absolutely sure about the identification unless an adult is examined under a microscope. You are welcome to send one to me at 32 Lodge Lane, Grays, Essex RM16 2YP (inside a small plastic container with a little tissue to hang on to and inside a small padded envelope is fine). 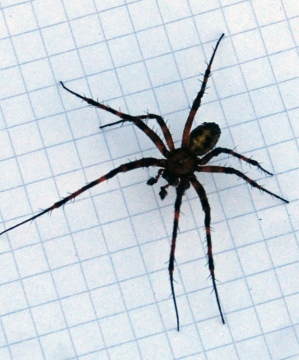 The annulated legs suggest M. menardi is probably correct, but we do not know how reliable this is in separating the two species menardi and bourneti. M. bourneti is undoubtedly under-recorded because in the past people have assumed they have menardi. I misunderstood your 'post' reference, thinking you actually meant post real spiders (by Royal Mail)! For the vast majority of the 670-odd British spiders there is no substitute for identifying real ones under a microscope. 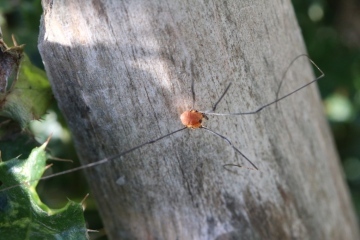 Starting at the top of your post,I would say the following:- Richborough Castle Kent TR3260 07.10.2013 (2) looks odd for colour and the legs, but I think is probably the harvestman Paroligolophus agrestis. 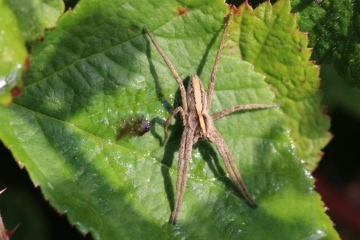 The next four down are all Pisaura mirabilis, a variable spider in terms of colour and depth of pattern. 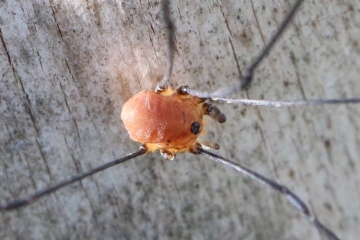 The next two are the harvestman Paroligolophus agrestis and the last two a male of the harvestman Leiobunum rotundum. 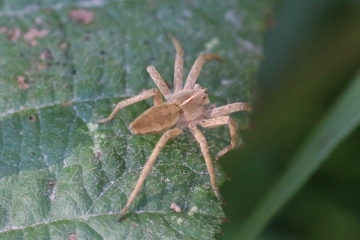 You have also uploaded more photos, Richborough Castle Kent TR3260 07.10.2013 (1) is Metellina female, probably segmentata, but you need a microscope to be sure. Minster Marshes Kent TR3063 30.09.2013 is Pisuara mirabilis again. Minster Marshes Kent TR3063 29.09.2013 (2) and Minster Marshes Kent TR3063 29.09.2013 (1) is a female Leiobunum. You need to be able to clearly see the eye banding. Minster Marshes Kent TR3063 24.09.2013 is probably Mitopus morio. 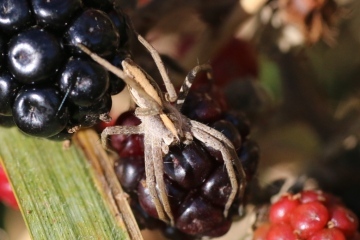 Minster Marshes Kent TR3063 23.09.2013 is Araneus diadematus. Minnis Bay Kent TR2668 21.09.2013 is Metellina species. Manston Kent TR3166 20.09.2013 is probably Mitopus morio. Pegwell Bay Kent TR3564 18.09.2013 is Araneus diadematus. Highstead Sand Pit Kent TR2166 12.09.2013 (1) and (2) are an Araniella species, probably either cucurbitina or opisthographa, but adults under a microscope are essential for species id. Highstead Sand Pit Kent TR2166 12.09.2013 is Tetragnatha species, adults under a microscope necessary for species id. Chislet Park Kent TR2163 30.08.2013 is Larinioides cornutus. 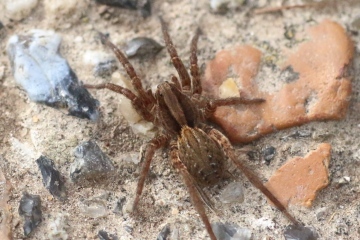 The new wolf spider photos are almost certainly Alopecosa pulverulenta, at this time of year probably juvenile. Yes, please post, but much better to send them in one batch. 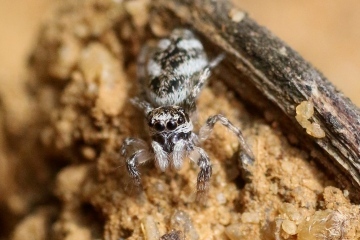 Thanks very much for the ID of the Zebra Spider, Peter. I attach another couple of photos to have a look at. I do have about 10 species this autumn taken in Kent which may or may not be identifiable. Are you happy if I post a couple a day for the next few days? 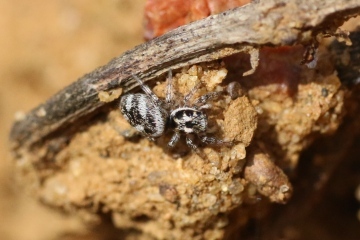 This will be the jumping spider Salticus scenicus, the 'zebra spider', but juvenile at this time of year. 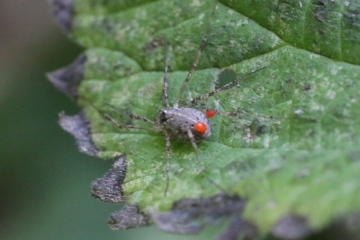 I saw this spider at Highstead Sand Pit in Kent (TR2166) on 12.09.2013. Is it possible to ID it from the photos? Yes, Nuctenea umbratica. Can you provide a postcode or Ordnance Survey grid reference please, so that your record can be added to the recording scheme. In my garden in July. 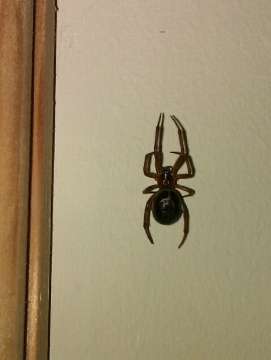 Yes, it seems to be Steatoda nobilis. Thanks for postcode. Here's another pic, still not great quality but abdo markings clearer. Does this help? Thanks. Yer sorry it's a dark pic. It's an old one. Got another living in the bathroom window at mo but every time I go for a pic it retreats. I'll keep trying. Post code is pe4 6ly. Many thanks. It is difficult to see the pattern on the abdomen because it is not lit enough. 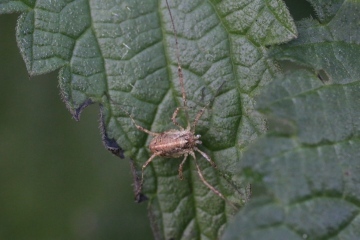 However by copying and lightening the photo, I would say the probable id is S. nobilis. 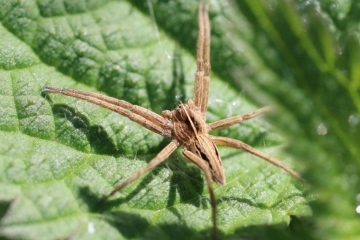 If you can get a better lit photo, can you also provide a postcode or Ordnance Survey grid reference for the spider so that your record can be added to the recording scheme. I would be very grateful for help with identification. 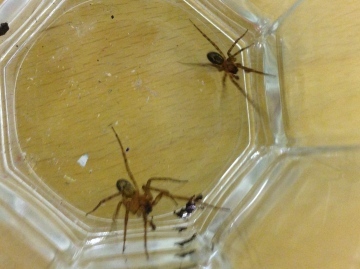 I am very new to spider identifying and my interest was bought about by finding these in the windows of our house. 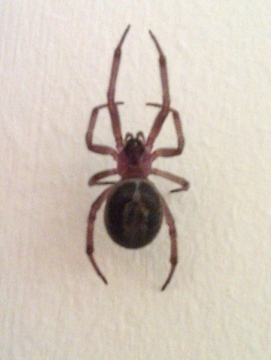 From my research they seem to be steatoda nobilis? But it seems to be rare (or under reported) in this area (Peterborough) and so I'm questioning my ID skills. Im aware ID confirmation from a pic is tricky but pointers on the appropriate steps would be welcomed. I would like to add we've lived happily with these spiders for sometime and I have no plans to remove them despite my husband's arachnophobia! 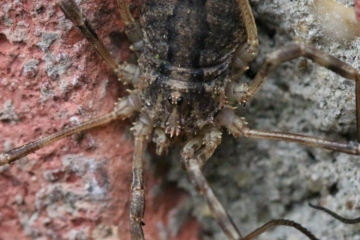 I've noticed that S. nobilis have become more commonplace lurking around my parents' garden shed (in London) over the last three years. The same structure used to be a guaranteed place to spot a few Nuctenea umbratica, which seemed to be the most obvious species before I noticed S. nobilis showing up. Whenever I have checked at night in recent times N. umbratica seem to be absent. 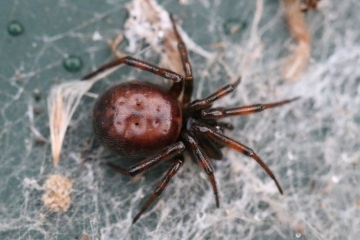 I'm in no way wishing to contribute to the hysterical demonisation of false widows - I'm just wondering if this represents a case of competition of some kind between these species leading to the reduced abundance of N. umbratica within a shared habitat. Maybe it's just coincidence, or the time of year, or some other factor. Has anyone else noticed anything similar?